Managing emails gets harder every day. It is not spam but I get more mail everyday by 8am than I get in my letter box over a 12 months period. A few years ago I could cope with the number of emails which was probably around 20 a day but now I am halfway through a Sunday and have received 42 emails. More and more are automated but there are others from people asking questions or wanting quotes. Regardless of the source they all require some attention. I have seen a lot of people put everything into different folders and keep it nice and neat but I for one don’t have the time to do this. There is a balancing act between being over organised and completing nothing and being somewhat organised and meeting deadlines. I do need to keep emails as they are important records of who has done what in conducting my business and I can always search through the emails. Other people use rules to file them automatically – this is like having a personal assistant opening your mail and filing it in a folder and wondering why you don’t know what is going on. There are cases where rules like this are useful but be careful with important email. The best system I have found to manage large amounts of email is called the Coneybeer Email Management System. I was introduced to it about a year ago and it still requires some discipline but the beauty of its design is in the simplify and if you go off track you can get back on again very easily. A lot of systems fail because as humans we tend to fall back into bad habits but with this system you can get it going again with minimal effort. As soon as you have completed an email in the inbox move it from the inbox to the completed folder if it is important or delete it if it is not. Your inbox then becomes your to do list. If you leave it to long you might end up with a big inbox again but just move everything from the inbox into completed folder and start again. Down the track you might want to create folders for Years and move mail out of the completed folder into year based folders so they do not get too big for searching. 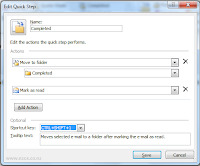 If you have Outlook 2010 completing emails becomes even easier because you have Quick Steps and can press the completed button and have it move it for you. 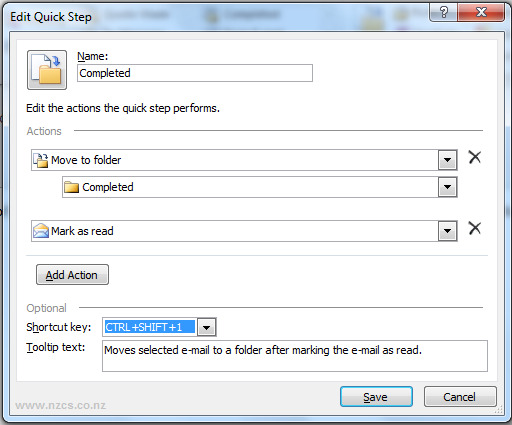 You can even assign a shortcut to this like CTRL+SHIFT+1 if you prefer to use the keyboard to move the selected mail to the completed folder.